← Love Bites bonus DLC: Introducing Ashley! Rumi was no more than a test subject, and unfortunately during her “training time” she lost her sight. Luckly, once Tom found out what was happening to Rumi, he used all his influence so that she could be released and join the regular army. Since then, Rumi Kai has always been considered an invaluable member of the team thanks mainly to her incredible psionic skills and code of honor similar to that of the ancient samurai. She treats enemies with respect, opposes decisions that she doesn’t consider “honorable”, and sometimes can show admiration for the most formidable opponents. Initially I simply reused Cursed Lands skillcheck system. That means: if you have the required value of skill XYZ, the check is successful. However I quickly noticed during testing that it wouldn’t work in this case, for a simple reason: in Cursed Lands the checks were done only for the main protagonist, here instead any member of the current team can do the check! Differently from the first game, the random number are generated in a way so that the infamous “save scumming” is not working. 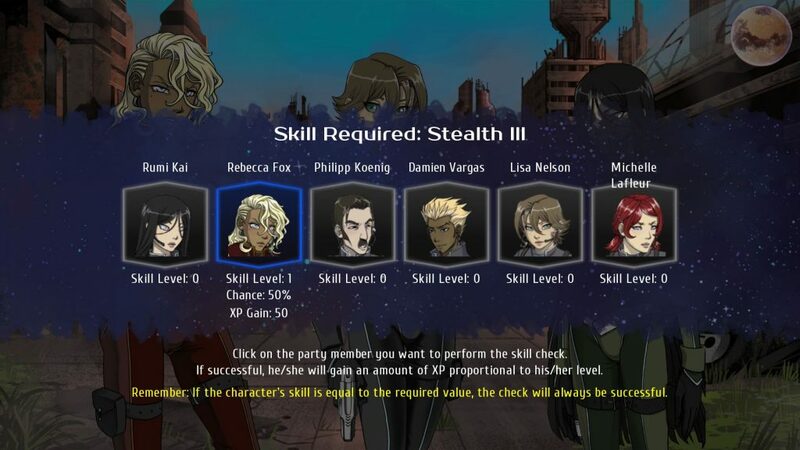 Even if you save before the skill check and reload 1000 times, the result for that particular check with that particular character will remain the same. I’m doing it this way since in the first game was a common strategy to save just before a skill check and try until you make it. However on the other hand, the success percentages here will be higher on average, so you should be really unlucky to fail a check (and even if you fail it’s not a game over anyway).